Imagine a bounty of fresh summer berries nestled together in a flaky tart shell with perfectly ripe star fruit, slices of kiwi and a light but rich layer of just-sweet-enough vanilla pastry cream. It’s the epitome of summer! The abundance of color and layers of flavor in our Fresh Fruit Tart make for an unforgettable summer dessert experience. 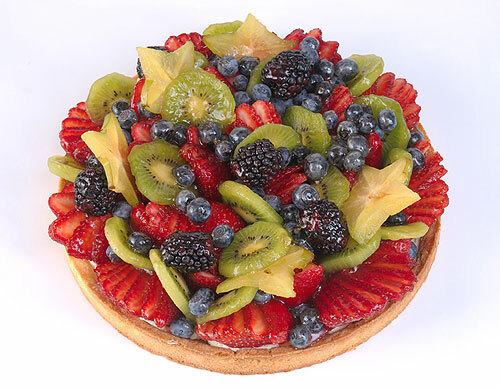 Today through June 14, you can get a special deal on our Fresh Fruit Tart. Simply mention that you read about it here, and we’ll give you 20% off a 9″ Fresh Fruit Tart (regularly $30 – serves 8-10), or buy four mini Fresh Fruit Tarts and get one free.